One of the many interesting features of devolution in Scotland is that turnouts at Holyrood elections have been consistently lower than turnouts at Westminster elections. On the surface, the reasons for this seem obvious: for example, there is more at stake in Westminster elections, the media coverage of British general elections, in both the broadcasting and printed media, is more heavily saturated, all the British political heavyweights are fully engaged in British elections, lending greater authority and legitimacy to British election campaigns and so on. This has been the position at least up to the 2010 British general election. To illustrate the point we can compare the performance of the four main Scottish parties at both British and Scottish general elections. Reading across the rows here, we can compare the number of votes that each party received in British and Scottish elections (columns one and two respectively), the change in the number of votes (column three), and this change expressed as a per centage (column four). For example, in row four outlining the SNPs performance 2010-11, we can see that in the 2010 British general election it received some 491,400 votes. In the subsequent Scottish election in 2011 it received some 902,900 votes. This was an increase of 411,500 or 83.7 per cent. Reading down the columns, we can compare the performance of each party at British general elections between 1997 and 2010, Scottish elections between 1999 and 2011, and the corresponding changes in votes between the two expressed numerically and in per centage terms. The most striking features here are columns three and four. What these tell us is that the lower turnout at Scottish elections is explained, at least numerically, by the fact that a substantial minority of the unionist parties’ voters at British general elections abstain from participation in Scottish elections. The uniformity here is striking. In every Scottish election that has followed a British general election since devolution, the unionist parties have lost votes, whereas the SNP, with the exception of a minor decline in 2001-03, alone among the main parties, has consistently increased its vote in Scottish elections compared to its vote in British general elections. Moreover, looking at the uniform pattern in the unionist parties’ vote, the pattern is most consistent among Labour voters. In every Scottish Parliament election since devolution, Labour has consistently lost, on average, around one third of the votes it won in the preceding British general election. The recent Scottish Election Survey suggested that there was a heightened mobility among voters of the four main parties in the May 2011 election. Underlying this, though, is a feature of the 2011 election that seems to have been overlooked in commentaries on the election result, and which is brought out clearly in our table. Looking at the decline in support for all the unionist parties in the period 2010-11, we can see that, in the Scottish election of 2011 all three unionist parties saw the largest drop in votes since devolution began. The Conservatives lost over 136,000 (one third) of the votes they had won in the preceding British general election in 2010, the Liberal Democrats lost 308,000 votes (two thirds), and Labour lost 405,000 votes (almost 40 per cent). Indeed, all three of the unionist parties received their lowest number of votes since devolution began. The obvious point to make here, a point underlined by the scale of the SNPs victory, is that the 2011 Scottish election was, to a great extent, the Scottish electorate’s verdict on the 2010 British general election result. The questions remain, however, why do all the unionist parties lose support at Scottish Parliament elections and, more interestingly, why is this phenomenon so consistent among Labour voters in Scotland and what, if anything, does this devolution deficit tell us about either the possible turnout and/or the outcome of an independence referendum? Here, we’ll address the first two questions only and consider the third question in part two. It’s tempting to answer the first question (the decline in support for all the unionist parties in Scottish elections) by restating the opening sentences in the first paragraph above. In other words, these are ‘British’-oriented voters who are, as a consequence, more likely to vote in British than in Scottish elections. The other plausible explanation here, related to this, is that there is, among a significant minority of voters of the unionist parties, a lack of faith in devolution. If this is correct, and there is surely substance in both of these arguments, then some of these votes are already in the bag for the No camp come the independence referendum. But for a number of reasons this is not a given for all of them. We’ve already identified two of these reasons. First, the 2011 Scottish election was, to a great extent, the Scottish electorate’s verdict on the coalition victory in the 2010 British general election. Given this, and given the growing crisis in both Britishness and the British state, it is difficult to see why these voters would warm to the coalition, or its position on the independence referendum over the next three years. Having said that, we need to bear in mind the different turnouts in British and Scottish elections and the impact of these on voting patterns, at least up to the 2010 British general election. As we’ll see in part two, this means, among other things, that the ‘national’ character of the independence referendum will be an important issue but it’s also the case that a referendum (particularly one on national independence) is very different from a general election. The other interesting unknown here is how those voters of unionist parties who abstain from Scottish elections will react in an independence referendum. 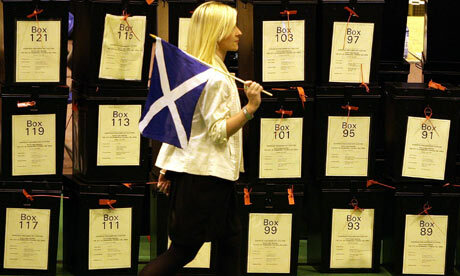 That is, if it is the case that many of these voters don’t participate in Scottish elections because the latter are seen as less important than British elections, because there is less at stake, because of the limited powers of the Scottish parliament and so on, then these reasons for abstention will clearly not be applicable in the independence referendum. In any event, it is Scottish Labour’s inertial vote (that is, those voters who will vote Scottish Labour, or support its position on an issue, in all circumstances) that will prove critical for the No campaign in the independence referendum. Second, we’ve already noted that in the 2011 Scottish election, all the unionist parties recorded their lowest ever number of votes since devolution. However, these voters didn’t simply disappear, many of them went to the SNP. Compare, for example, the SNPs vote in the 2007 election with the 2011 election, it is not merely a coincidence that the increase in the SNPs vote here, some 239,000, approximates to the decline in votes for all three unionist parties in the same period, some 280,000. There are a number of other reasons why the votes that the unionist parties receive at British general elections cannot be considered as an inertial vote for the No camp in an independence referendum (that is, voters who will vote No in an independence referendum in all circumstances). But we need to move on to the second question posed, that is, the peculiar consistency of the decline in Scottish Labour’s vote in Scottish elections from their preceding ‘British’ vote. It is a truism in Scottish politics to acknowledge that, historically, or at least for much of the post-war period, Scottish Labour has been the main beneficiary of the Scottish electorate’s anti-Tory reflex. For example, Scottish Labour’s two largest votes in British general elections, after the 1951 British general election, both occurred after prolonged periods of Tory government in Scotland – in 1964, after thirteen years of Tory government, and in 1997, after eighteen years of Tory government. As the leading party in Scotland for much of this period, Scottish Labour, as with the leading parties in all countries, has also benefitted from a high inertial vote. So, on the one hand, Scottish Labour’s historical status, as the main beneficiary of the Scottish electorate’s anti-Tory reflex, has inflated its vote in British general elections as many non-Tory voters in Scotland have mobilised around Scottish Labour in an attempt to keep the Tories out at Westminster. And, on the other hand, Scottish Labour’s high inertial vote has underpinned its status as Scotland’s leading party in British general elections. Curiously, what devolution seems to have thrown up is the significance of these two factors, hence the consistency of the decline in Labour’s vote in Scottish elections. In other words, Labour’s vote at Scottish elections may be seen as a proxy for its inertial vote in Scotland. What’s crucial here, though, is that both of these factors have weakened significantly in recent years, consequent, among other things, upon the legacy that New Labour has bequeathed to Scottish Labour and the impact of this on many Scottish voters. This is why the results of both the 2010 British general election as well as the 2011 Scottish election are so important. If there is substance in these arguments then this, in turn, suggests a number of possibilities for the independence referendum and we’ll look at some of these in part two. Here though, in conclusion to this part, it’s worth drawing attention to a few other possibilities. Both Scottish Labour and the SNP take national pride in, and earn a great deal of political capital from, Scotland’s anti-Tory reflex. If anything, the Tories are becoming even less popular in Scotland than they were in previous decades. However, part of Scottish Labour’s problem, and something that every Scottish Labour voter should be reminded of in anticipation of the independence referendum, is that in the densely populated south-east of England as well as in the south-west, Labour is even more unpopular than the Tories are in Scotland. For example, in the 2010 British general election, the Tories received a 17 per cent share of the vote in Scotland. In the south-east of England though, Labour received only a 16 per cent share of the vote and in the south-west of England Labour’s share was only 15 per cent. Indeed, of the current 136 Westminster seats in the south-east and south-west of England, Labour holds only eight of them (less than six per cent). Given the anti-Tory reflex in Scotland, this suggests, among other things, that the Scottish electorate’s perceptions of the fortunes of the Tories at Westminster may also have a bearing on both the turnout and the outcome of the independence referendum. In this respect, the proximity of the referendum to the next British general election in 2015 takes on an added significance. The critical issue here, then, particularly if the Tories are seen to be doing well in England, is the extent to which Scottish Labour may be seen, even by many of its own voters, to have exhausted its capacity to mobilise an anti-Tory vote in Scotland. One of the reasons this is so critical, notwithstanding its impact on the outcome of the referendum, is that, the other side of this is that what has changed in Scotland, as the 2011 result indicated, is that it is the SNP that has acquired the capacity to mobilise an increasing share of anti-Tory sentiment in Scotland. That suggests another possibility here, one which could provide a winning strategy for the SNP in the independence referendum, and which means that the SNP would not have to rely only on the haemorrhaging of support for Scottish Labour or, for that matter, the fortunes of the Tories at Westminster. That is, if the SNP was to take a social democratic turn, or a more emphatic social democratic turn than it has, so far, taken. This can only be hinted at here, not least because it needs a more detailed analysis in five broad areas. First, we need to address the conventional wisdom that social democracy is ‘dead’. Second, we need to outline what a social democratic agenda for the twenty-first century may look like. Third, we need to identify the specific policy areas where the SNP, in making this ‘turn’, could not only out-manoeuvre Scottish Labour but which could be used to shape the preferences of the Scottish electorate to independence, by amplifying those social democratic policy instruments and policy objectives that only independence could deliver. Fourth, this strategy could also form a core part of the SNPs vision for the future of an independent Scotland. Since the 1979 British general election it has been apparent that most of the Scottish electorate want to follow a different path to the rest of the UK. The SNP needs to steer these long-held aspirations into a more clearly defined agenda, a more emphatic social democratic turn is unquestionably the best means of achieving this. Finally, while it’s clear that the SNP needs to continue to widen support for independence, equally important, it needs to deepen support for independence. An appeal to the social democratic instincts of the majority of both Labour and SNP voters would surely enhance the prospects of a Yes vote in the referendum, particularly when the very best that both the Tories and Labour at Westminster could offer is a return to business as usual at some undetermined point in the future. Excellent analysis Donald. Timing as the FM knows only too wel;l will be critical in the referendum! Good article Donald, looking forward to your thoughts in part two. Thanks for the comments. Gabriel, point taken, will try to make sure that part two (early in the New Year) is shorter, can’t help you with your sleeping patterns, though – have you tried Ovaltine? Bella (Mike/Kevin?) re the ping back, there are worse fates that could befall an independent Scotland than to attempt to replicate the ‘Nordic’ experience, but, for various reasons, that’s not exactly what I’ll be arguing for, though I suspect it may be closer to what the SNP will be promoting. As a means of increasing support for independence in the referendum maybe that’s no bad thing, but for me, inasmuch as I ‘support’ the Nordic approach, it’s a point of departure not a destination. There’s a bigger project here than the one that I outlined in the concluding paragraph in the piece, and that maybe we should get back to once all the social democracy stuff is out of the way. More specifically, it’s the sterility of the ‘either neo-liberalism or Keynesianism’ debate and the ensuing poverty of choice that is the source of our current malaise. Far from being ‘alternatives’ they are two sides of the same coin. For that reason, I’m not advocating a ‘return’ to Keynesianism either or, for that matter, even a return to Keynes, or at least, if we do ‘return’ to Keynes, it should be to challenge the axioms of both mainstream economics and market fundamentalists. That’s also why I think that the left needs to distance itself from the money reformers and the ‘greedy bankers’ narrative. I won’t chunter on about it here though, as I say, this is a much bigger project, maybe we can come back to it next year?